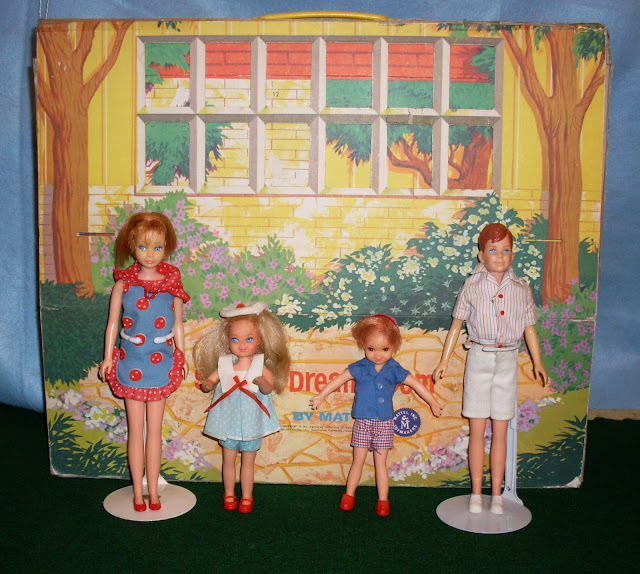 look like they are floating slightly above ground. 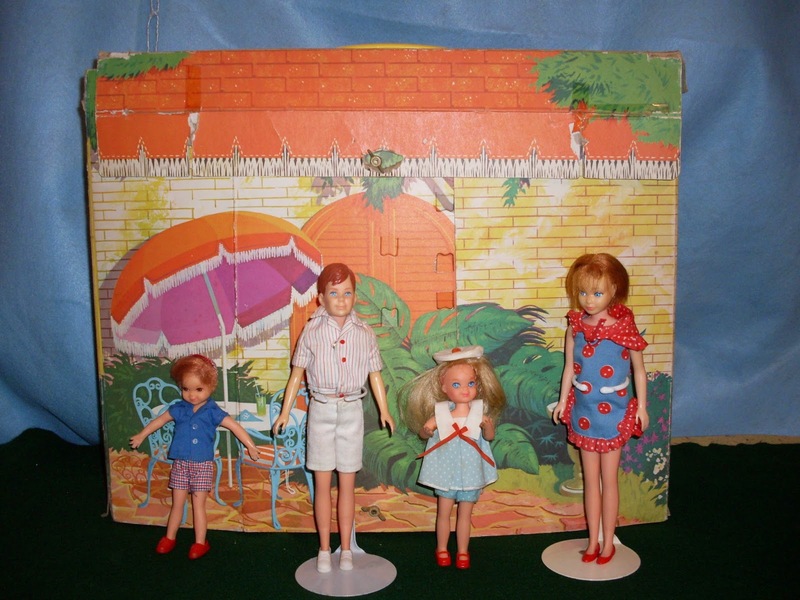 Skipper, Tutti, Todd and Ricky take refuge under the trees on a hot summer day. The back of the closed-up Skipper Dream Room. Todd and Ricky plan a game of table tennis on the patio of the Skipper Dream Room. come inside the Skipper Dream Room to cool off. 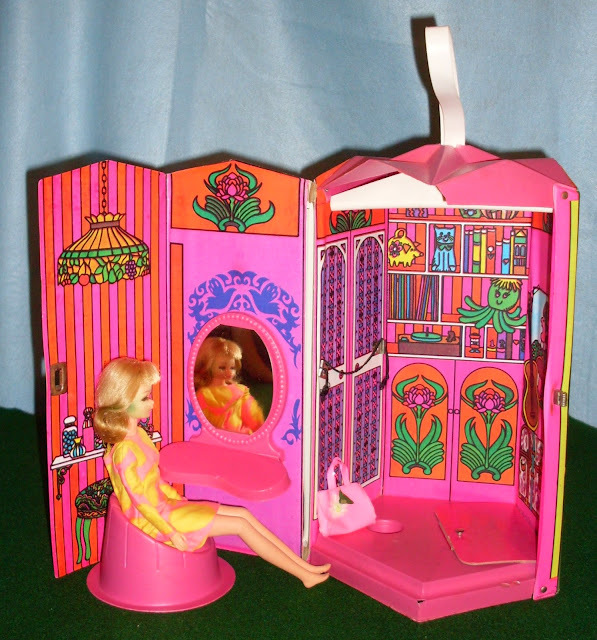 graphics of all of the Barbie houses. and changed her hair color. 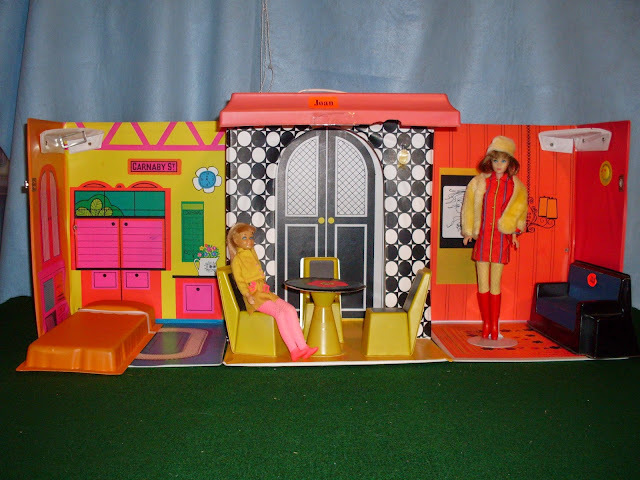 Skipper's and Barbie's outfits match the interior of the Family House! 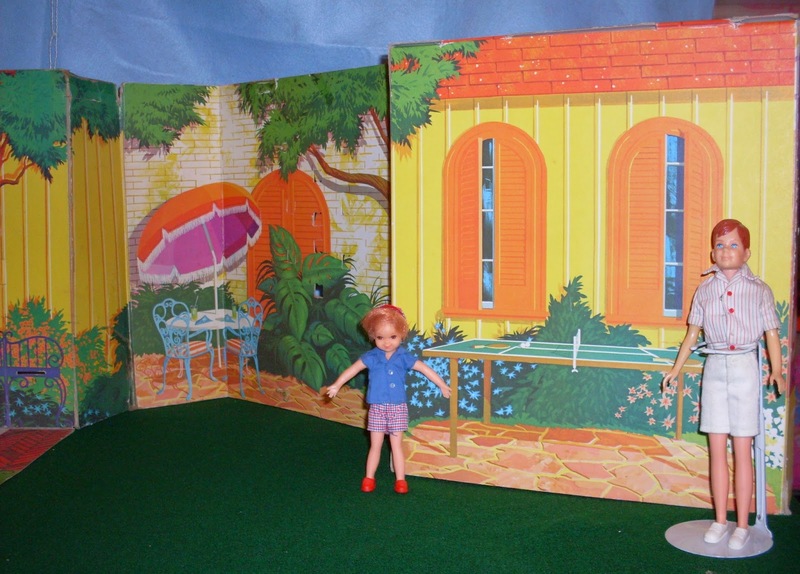 The exterior is yellow brick and wood paneling with bushes and trees. The front has a functional window and the back shows patio furniture and a Ping-Pong table. In the interior, I am including Suzy Goose #414 Skipper Vanity from 1966. My dolls are the pink skin redhead Straight Leg Skipper in #1923 Can You Play?, pink skin Ricky in #1505 Skateboard Set blonde Tutti in #3602 Ship Shape and Todd in his original outfit, all from 1966. The exterior is pink and orange walls with overhead Tiffany lamps. The interior is dark pink and lavender. 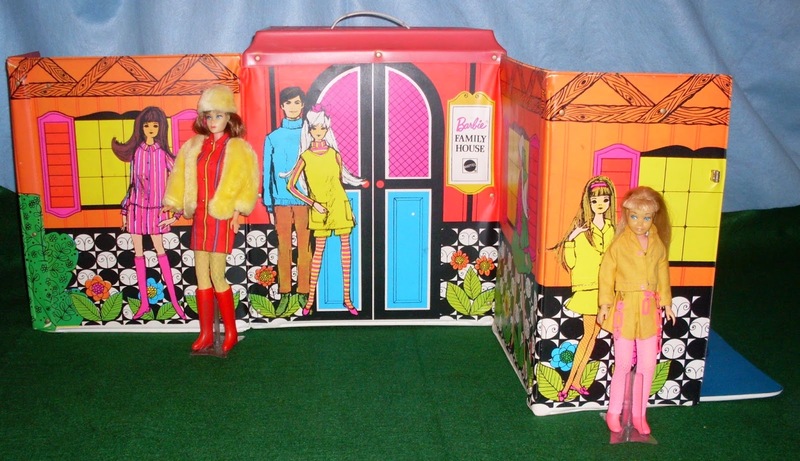 My doll is a 1966 brunette Bend Leg Francie in Sunspots. The exterior is orange paneling with a black and white checked foundation. The interior consists of four rooms: a yellow bedroom, a red paneled living room and a black-and-white combination foyer and dining room. Note that Skipper and Barbie match the interior. 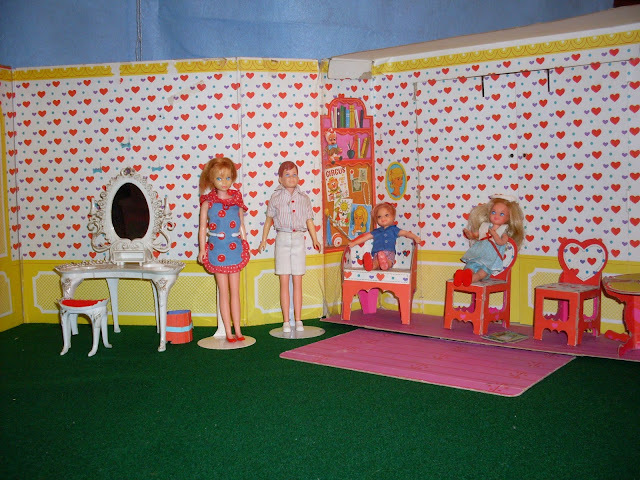 This was my sister Joan's house as a girl (as you can see by her numerous decals! ), but I have permanently "borrowed" it. 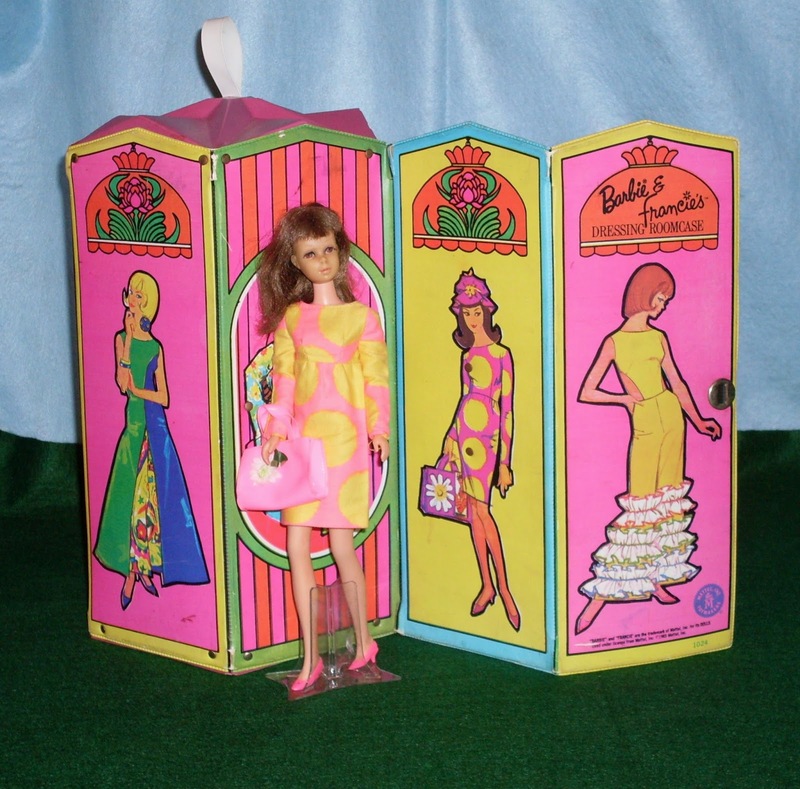 My dolls are a brunette 1967 Twist N Turn Barbie in Smasheroo and a blonde 1968 Twist N Turn Skipper in Real Sporty. This Skipper is my childhood doll, who I received for Christmas in 1968 (yes, I know she is not in mint condition).